What’s the fuss over bone broth? Ever heard of bone broth? At least as a term, bone broth is relatively new, popularised — even hipsterised — by the rise of the Paleo diet, which focuses on the consumption of meat, fish, vegetables and fruit, or the kinds of foods that may have formed our diet during the Paleolithic era. The broth, usually homemade but increasingly available at shops and through special order, boasts a thick texture with a pronounced flavour, and it’s the latest darling of the health food world, with cookbooks, websites and even a local restaurant devoted to the stuff. Proponents of bone broth, which is touted as a new superfood by some, the next miracle elixir by others, rattle off a laundry list of benefits, arguing that it combats everything from rough skin and joint pain to arthritis, intestinal issues and even hormonal imbalances. Brothing might just be the new juicing. So what is bone broth? Essentially, the liquid is nothing more than a pot of bones and water, maybe vegetables and herbs as well, slowly simmered for hours until all of the flavors and nutrients are extracted from the ingredients. Which, of course, sounds an awful lot like stock, that lowly kitchen staple. The label may be new, but bone broth is about as revolutionary a technique as live-fire cooking. And, of course, pots of bone-based stock are one of the fundamental building blocks of classic French and other cuisines as well as a basic kitchen utility, born out of a desire to use every trimming and kitchen scrap, from leftover bones to wilted parsley stems. Unsurprisingly for an age-old recipe built on little more than bones and water, a great pot of whatever you want to call this stuff is easy to make at home. Just be sure to give yourself plenty of time. The most important ingredient of a good bone broth is — wait for it — the bones. Bones define the type of stock (beef, veal, chicken, fish) and determine its flavor and thickness, and you’ll want five to six pounds for about every gallon of stock you make. You can use almost any bones, but certain types are prized. 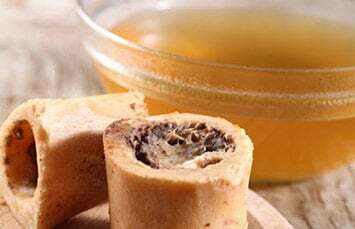 Those high in cartilage, such as knuckle bones, make terrific stock, as the collagen in the cartilage thickens the liquid, providing body as well as flavour. Neck and back bones, as well as feet, are also very good for this. As collagen is heated, it transforms into gelatin (think Jell-O); release enough gelatin into a stock and it will solidify when chilled. If possible, cut up the bones so the pieces are no bigger than a few inches each; this will allow their components to break down more quickly and easily. Bones lend texture and definition to the stock, but it’s meat that contributes real flavour, particularly tougher meats that are high in connective tissue, another source of collagen. Look for meaty knuckle bones or leftover chicken carcasses (raw is best, but the picked-over bones from a roast chicken work well too), as well as trimmings from a roast or a braise. For richer flavour, roast the bones first: Place the bones on a tray in a 450-degree oven until they’re dark and brown, a half hour or so before adding them to a stock. In addition to bones, consider other flavourings, such as vegetables or herbs. For a classic French stock, a blend of onions, carrots and celery — called mirepoix — is added, along with things like parsley, thyme and whole peppercorns or cloves….